Numerous times over the last couple of years, I've referred to my master bedroom re-do and promised to share the results. Well, much like with my Ikea kitchen re-do, it's taken a couple of years to finally write that post. On the other hand, except for adding a yellow zebra-print chair and a trio of small mirrors above the bed, the room still looks exactly as it did when we completed it a couple of summers back. For better, and for worse. So off we go. Our room faces south/southwest, and being upstairs, is easily the hottest, brightest room in the house, especially with one big, long wall of windows. Seriously, it's an oven in this room from late July through October. I would've loved to have a beautiful lighting fixture, but sleeping without a ceiling fan just isn't an option. Ah, look at that angled ceiling slope. Don't forget, this is my House of Many Angles. My Nate Berkus headboard, purchased online at HSN a couple of years ago. I'm very happy with the quality. This is the same area, with the recent update of a trio of small starburst mirrors. Yellow pillows are from Target, again a couple years back. My version of the Ikea Rast hack that's been all over the interwebs for awhile. These nightstands started out as unfinished pine. I should probably update the knobs from these Home Depot silver ones to the brass ring pulls shown in the original hack (at least the one I copied), but I was lazy and didn't feel like ordering them online. Not very much in the spirit of the William Morris project, I know. The main reason behind my delay in posting about my room is that it's never felt entirely "done" to me, even after two years. I'm the first to say that it's sorely lacking another layer of interest, via more pattern or color or (especially) artwork. The Big Gray Wall of Nothing. I've been completely in a twist about what to with that big space. If I was an HGTV Design Star contestant, no doubt I'd have created some awesome installation using molding or stencilling or shiny hubcaps by now. But no. It sits as empty and devoid of interest as ever. 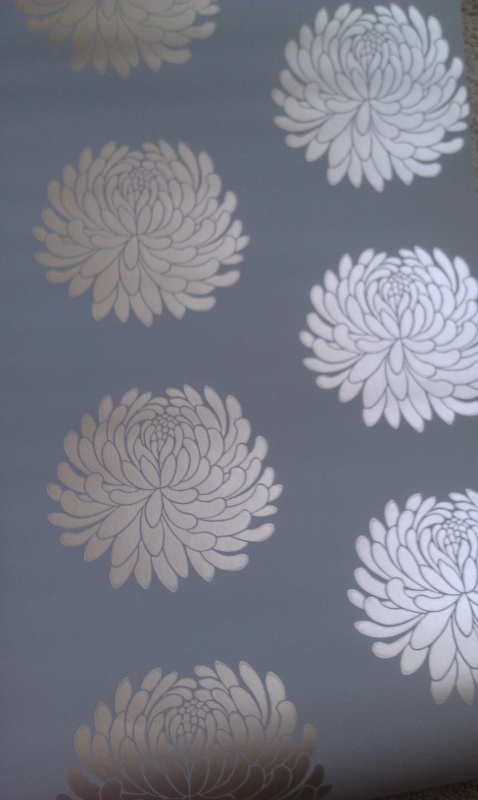 The paper is gray-blue with metallic chrysanthemums, that read a little gold or a little silver, depending on the angle. I also want some some artwork for this bare wall next to the husband's side of the bed. Well. There you have it. Despite being "undone," our master bedroom is still a nice retreat (especially when I put away the laundry and make the bed). It's a little more formal than the rest of the house, with all the symmetry in the lamps, tables and pillows. Of course, our double doors are usually open, so it's hardly the private, modern hotel room that may have been its inspiration. But considering that the master bedroom is often the most neglected space for a lot of families, I guess we've done okay. If only I can get that wallpaper up before the end of the year, I'll be thrilled. Oh, and a side table beside the chair, so I could actually set a drink or book down someplace other than the floor, would be a good addition, too. On Thurdays, I'm linking up with Jules as part of her 2012 William Morris Project. We have a door to our bathroom, but there's not good space for it. (You can't open the vanity drawers all the way when the door is open, which is almost always is.) I never thought of replacing it with a curtain. Wondering if you wish it were a real door instead? Rita...hmmm, I don't really miss a door, I've had some kind of curtain there since we've lived here. (There IS a private "water closet"/toilet area within, with it's own door.) It's just the nature of this "open concept" type of house. For the wall paper panels, first figure out on the wall how you ant them to go. Then, I'd think it would be easier to try foamcore (or something similiar) and then frame that out when you put it on the wall.) Adhering the paper to the actual wall feels scary to me--no room for error! But, really, how badly could it go? That photograph above is lovely. It ould go so well with your pillows, too. You have a great space--so serene. Thanks Alana! The issue with foam core is that I've done some research, and it seems to crease and/or bend a bit after being up on the wall. I'm thinking I may have to bite the bullet & just apply directly to the wall. Eek.